Welcome back, dead-heads! And, how are we feeling today? I don’t know about you, but I was definitely ready for bed last night. Talk about a draining experience! Naturally, I have lots to say and little time to do it in, so let’s jump right into this, shall we? CLICK HERE to read a Spoiler-Filled recap of exactly what went down. All caught up? Good. Let’s proceed. Sadly, this episode was spoiled for many a few months back when a photograph of Michael Cudlitz holding the dummy-prop of his smashed head was released on Instagram. The photo was removed rather quickly, but not before fans had taken screen shots and circulated the evidence. To cover, info was leaked that death scenes had been filmed for each member of the cast. This was intended to make you question if what you were seeing and hearing on the internet was or was not legit. But, it was too late. We had already known Abraham was doomed thanks to Denise, her Orange Crush (come on! ), and her borrowed death scene. We saw that one coming from a mile away. Though, admittedly, I hoped they would go a different route. 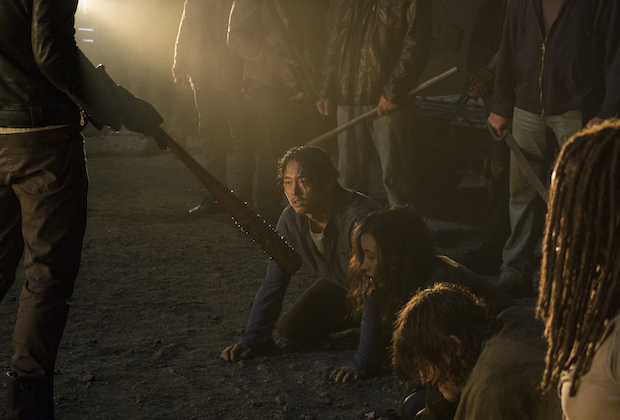 Deep down, I knew who the two victims would be, yet hoped that they would eliminate Glenn and Maggie together. Before you argue, hear me out. The series has already done plenty of shuffling when it comes to character story lines. A number of the living characters we have now on the show do not even exist (or are long since dead) in the comics. The series is “based” off of the comics, not an exact interpretation like some sort of historical reenactment. It’s all fiction. Killing Glenn and Maggie together would have been the “hard left turn” that producer Scott Gimple promised, as comics Negan has rules regarding the murder of women. It would have been tragically romantic and shocking, to say the least. Maggie’s story as leader of the Hilltop could have been given to Carol or Sasha. Alas, we are going to hang on to Maggie for a while longer. Unless….oooh…unless they give her Carol’s comic character suicide. Now that would be an amazing story to write. I love that the title of this episode is “The Day Will Come When You Won’t Be”; the words Dr. Jenner spoke to Rick at the CDC after Rick expressed gratitude for being given the chance to survive. It was the perfect way to cap off the tribute to the world as we knew it. Season 6 did a great job of paying homage to seasons past. Nearly every episode contained a throw-back quote, moment, or object, clearly intended to tug at fans’ heartstrings. But, that world is gone now. It irks me to see so many fans (or even non-fans) of The Walking Dead complaining about everything from the writing, to the use of the cliff-hanger, to the loquaciousness of Negan. This arc was lifted perfectly from the source material. These same people used to complain all the time when stories didn’t follow the comics. They finally get material that is nearly verbatim, and they still complain. This is a rant for Rotter Fodder, so we’ll come back to that on the podcast. Jeffrey Dean Morgan is a dream. I couldn’t have hoped for more perfect casting than him. Morgan’s charismatic grin epitomizes the very essence of Negan. I can’t wait to see what he has in store for us this season. I am going to love hating him. I actually liked the way the show revealed the death scenes to us. We didn’t have to wait long, maybe 15 minutes, and that time was put to good use. Rick thinking about each of his friends, those flashes of life amidst the terror in his eyes, and then the realization-from his perspective-of what actually happened, was hypnotic. My husband asked if I was alright during the first commercial break. It seems I was on the verge of an asthma attack and he could hear that my breathing had changed. “It’s just a show. You’re okay,” he said to me. He was so wrong! My heart was beating faster. My breathing was labored. We were all frozen in our seats. The victim had been chosen. And in that moment of impending doom, Abraham discreetly held out his fingers in a peace sign towards Sasha; his way of telling her he loved her. That was it. I was done. Hands over mouth, tears started flowing. The guy had basically just proposed to Sasha in the RV before they were captured. The torment in knowing their love story yet watching Rosita’s heart being torn apart was too much for my hopelessly romantic self to bear. Negan then taunting Rosita made my skin crawl. I admit, I was nervous when Daryl jumped up and punched Negan. I thought that was it for him. Then, for a moment, I thought that “hard left” would come in the form of Negan killing Rosita just to spite Daryl for his efforts. That would have been nuts! I still stand by what I said last season about Dwight having saved Daryl by shooting him. Daryl had saved Dwight. Unfortunately, Dwight made some mistakes, namely betraying Daryl, getting caught and burned up by Negan. So when their paths crossed again (bye, Denise) Dwight was surrounded by Saviors and had some expectations to meet in order to stay alive. He shoots Daryl, but doesn’t kill him. This act was a way of showing loyalty to the Saviors, in the moment, and throwing Daryl a bone. When Negan is assessing the group, deciding who to kill, his “eeny meeny miny mo” game is for show. 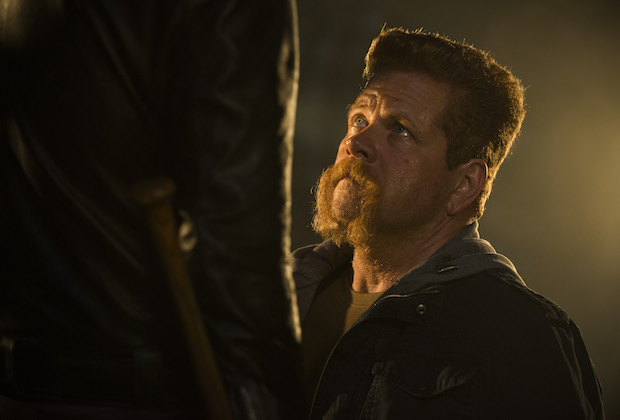 He has already determined who he thinks is Rick’s “right hand man”, the tough guy, the biggest threat…Abraham. Glenn’s death was a direct result of Daryl’s actions. Negan doesn’t realize that Daryl is the actual right hand of Rick. Abraham and Daryl were both present when the Saviors were hit with the rocket launcher. 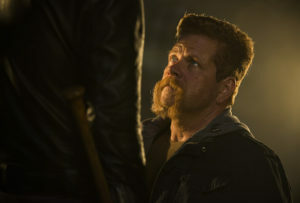 But, Abraham is the one they witness throughout the day, driving Rick around in the RV and challenging the Saviors. Daryl, is now seen as a wounded, frightened, randomly captured member of Rick’s group. Only Dwight knows the difference. And he isn’t giving that info up any time soon. Trust me. 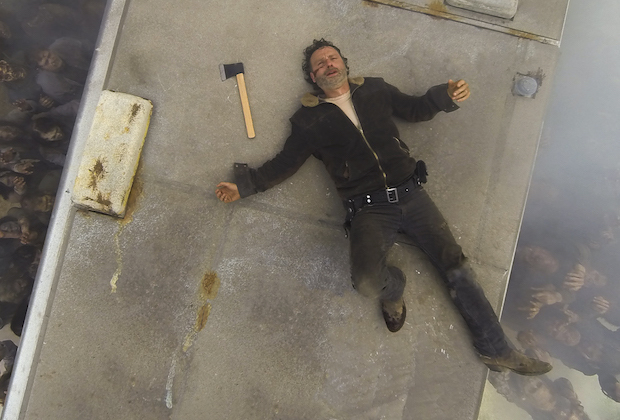 Negan’s attempts at breaking Rick were hit or miss for me. All of that effort in the fog with the walkers felt like it dragged on too long, save for the bits in between where Rick is thinking about the rest of his group. What an emotional roller coaster! Watching this episode as a wife and as a mother, was very difficult. Never mind having to silently sit and watch one of your best friends be viciously attacked, but could you sit there and watch it happen to your spouse? I feel a pit in my stomach just thinking about it. But that wasn’t even the worst of it for me. Could you maim your child in order to prevent the death of your child and numerous other friends? My husband and I tried to talk about that after the show ended and we couldn’t find the words. That moment where Carl looks at his father and tells him to “do it” tore my heart out. Earlier in the episode, I remember thinking that I wanted to smack Carl. Everyone else was shaking, sobbing, unable to breathe. But, Carl barely had a noticeable tear streaming down one cheek. I thought, man, Negan was right. This kid is a future serial killer. But when he told Rick to take his arm, everything changed for me. I hadn’t thought about it until then, but the last time we saw Carl really cry was after Rick pulled that Claimer off of him and sliced him from the bowel to the jowl. He cried when the prison fell at the point they found Judith’s empty car seat. Carl completely broke down when he thought his father had turned (the night before Michonne finds them in the house). And he cried when the Claimers were attacking. But, watching Rick murder that man, Carl’s tears slowly stopped. We talk about kids being desensitized to violence because of movies and video games, but Carl is a stone-cold child of the future now. What I wrote off as bad acting has actually convinced me that Chandler Riggs is one of the better actors on the show. Obviously Carl is hurting, but to remain so outwardly unaffected by your surroundings, it makes me wonder what level of plotting is going on in his brain. 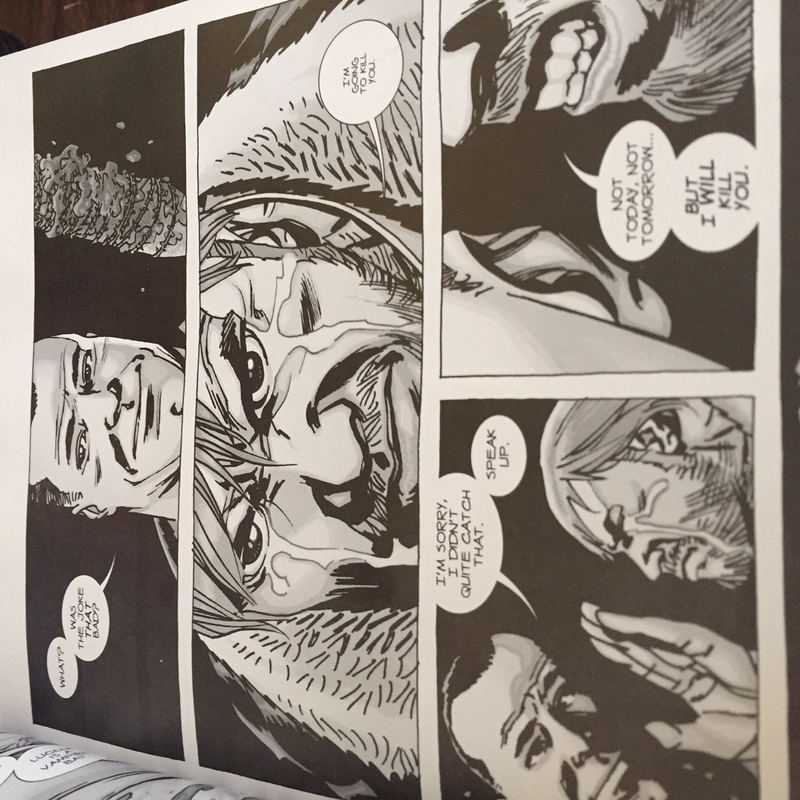 I truly hope the series follows the comic story arc between Carl and Negan in the coming seasons. Good stuff, right there. Saying goodbye to one of the original Season 1 cast members (for the first time since Woodbury fell) was definitely a kick in the gut. I think fans who were worried that the series was becoming redundant will be pleasantly surprised from here on out. Season 6 put the old stories to rest, while Season 7 ushers in a new world order. 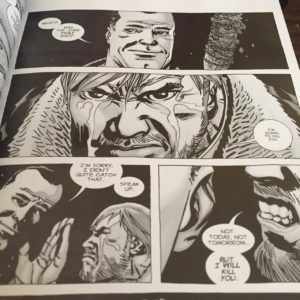 If the level of gore of the living was any indication, Negan’s reign is going to be giving me agita for quite some time.